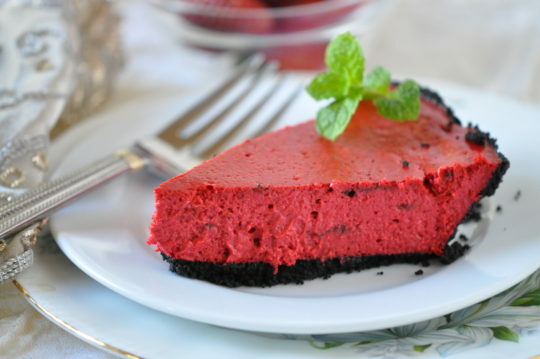 Two popular desserts, red velvet cake and cheesecake create the ultimate indulgence. This delicious recipe is from Holly Clegg's trim&TERRIFIC Kitchen 101: Secrets to Cooking Confidence. Bake 35-40 minutes or until center is firm. Turn off oven and remain in oven 30 minutes. Terrific Tidbit: For chocolate crust: 1 1/4 cups chocolate, 1 tablespoon sugar, 1/2 teaspoon vanilla extract, 2 tablespoons butter melted, combine all, press into bottom of spring form pan, and bake 350°F 10 minutes. Find more recipes from Holly Clegg's trim&TERRIFIC Kitchen 101: Secrets to Cooking Confidence.